John C. Maxwell is nationally recognized as the authority who brings biblical principles to leadership and personal objectives. His insights have helped millions of people make life-changing decisions and unlock their potential. 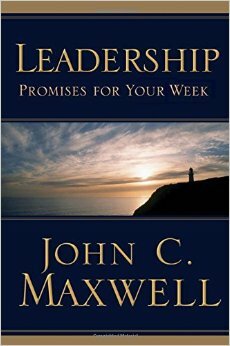 In Leadership Promises for Your Week, he distills many of his winning concepts and scriptural meditations into a weekly devotional. Delivered with his trademark style of confidence, clarity, and encouragement, Maxwell addresses a host of vital topics including success, teamwork, communication, conflict resolution, stewardship, and mentoring. Each week explores one facet of leadership in a format perfect for the busy leader. You’ll discover that: Leadership begins at home. Connecting in relationship precedes connecting as a team. Healthy confrontation is a redemptive act of leadership. Integrity is more important than image. Investing in others creates a leadership legacy. Each week includes a promise that God has made to leaders, a promise good leaders make to their teams, a quick lesson, and a thought or activity to help carry you through the week.